What would you like to do next with Luke 14:12 | Finding Shared Humanity in Hospitality ? “In our world full of strangers, estranged from their own past, culture and country, from their neighbors, friends and family, from their deepest self and their God, we witness a painful search for a hospitable place where life can be lived without fear and where community can be found. Our society seems to be increasingly full of fearful, defensive, aggressive people anxiously clinging to their property and inclined to look at their surrounding world with suspicion, always expecting an enemy to suddenly appear, intrude and do harm. But still – that is our vocation: to convert the hostis into a hospes, the enemy into a guest and to create the free and fearless space where brotherhood and sisterhood can be formed and fully experienced." - Hospitality is more than a word – it is an action. 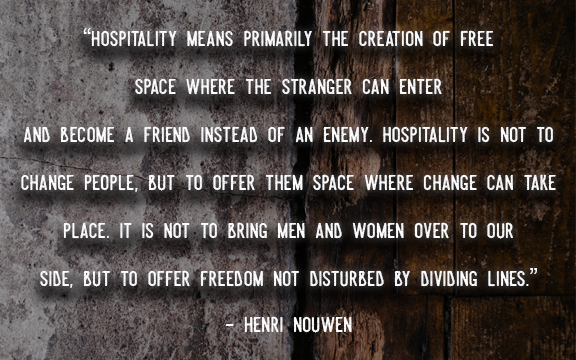 Find ways in your community to share in hospitality with others. Luke 14:12 is one of many organizations in the Nashville area that serve others. Find your local organizations that develop human connections with others. - Be self-aware of your own biases and prejudices. In order to truly be in service with others, we must self-identify our own “dividing lines”. Henri Nouwen, among other authors, offer us glimpses into ways we as members of humanity can slowly progress in blurring our constructed lines. - Talk to people, not about people. One of the main motivators and easiest tasks in hospitality is talking to people. We seem to get caught up in talking about others while missing opportunities to actually experience the other. The narratives of others are transforming. - Theological interrogation. Putting a focus on the other transforms how we think theologically. A good book to help get you started in thinking theologically about those different than ourselves is God and the Excluded.